A 12.5-inch Chromebook tested with Chrome OS 56.0, an Intel Core m3-6Y30 2.2GHz processor, 4GB of memory, Intel HD 515 graphics, a touchscreen, and a 64GB eMMC drive. 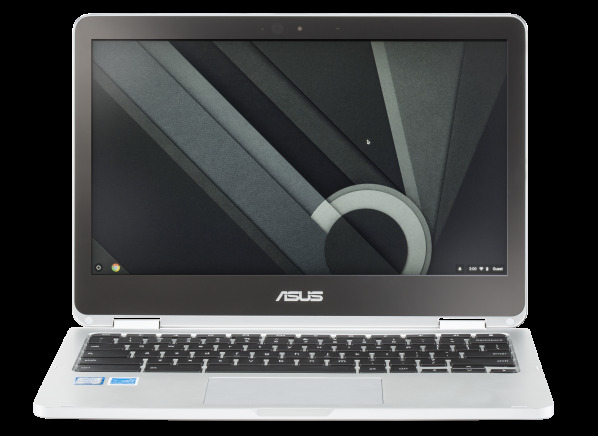 The Asus Chromebook Flip C302CA-DHM4 is a 12.5-inch Chromebook with an LCD resolution of 1920 x 1080. It has 4GB of memory and a 64GB eMMC drive. It has an Intel Core m3-6Y30 2.2GHz processor and Intel HD 515 video adapter but no dedicated video memory. It was tested with Chrome OS 56.0. The Asus Chromebook Flip C302CA-DHM4 has a built-in microSD memory card reader for digital photography, a touch screen, and 2 type-C USB ports. But you will lose a USB port to the power cable when charging the Chromebook. It supports WiFi 802.11ac, so it's compatible with the latest high-speed routers. It is compatible with Google Play for downloading Android apps and games, although access is not easily available out of the box, and it has a gyroscope and accelerometer that can enhance interaction. The Asus Chromebook Flip C302CA-DHM4 measures 12.1 inches wide by 0.6 inches high by 8.3 inches deep and it weighs 2.5lbs. It's backed by a 12 month warranty, with 12 months of free tech support by telephone. Results in the following chart are gathered from Consumer Reports’ 2018 Winter Survey of 1,237 Chromebooks, owned by members who purchased a new device between 2013 and 2018. Our predicted reliability ratings are based on a statistical model that estimates problem rates within the first 3 years of ownership, for Chromebooks that are not covered by an extended warranty or service contract. We also adjust for the median number of hours of use per week. The median in our survey was 15 hours per week. Higher ratings are indicative of better reliability. Brands receiving a red or orange rating cannot be recommended by CR at this time. Our owner satisfaction ratings are based on the proportion of members who are extremely likely to recommend their Chromebook to friends and family. WiFi WiFi The type of built-in 802.11 wireless networking supported. Chromebooks with 802.11n also support 802.11g routers. Some models with 802.11n also support the 5GHz "high band," a standard suitable for apartments and other crowded areas. 802.11ac is the newest, fastest type. Gigabit Ethernet Gigabit Ethernet Support for 1000 Mb/s networking. Number of USB ports Number of USB ports Number of USB ports for printers, flash drives, or other peripherals. Built-in webcam Built-in webcam A built-in webcam for videoconferencing. Memory (GB) Memory Also known as RAM, memory is a temporary storage area for data. Its size is an important factor for performance. Video adapter Video adapter Also known as the video card, the video adapter processes all the data that you see on your screen. They come in different speeds and may be integrated (most common, but is slower and uses up memory) or discrete (which is faster and has its own dedicated memory). Width (in.) Width The width of the Chromebook while closed. Height (in.) Height The height from the table, or thickness, of the Chromebook while closed. Depth (in.) Depth The depth, from the front edge to the back hinge, of the Chromebook while closed. Thin and light Thin and light Based on weight and thickness. This includes Chromebooks that may be labeled "Ultrabook," "Sleekbook," "Thin and light," and "Ultrathin," among other terms. Operating system (as tested) Operating system (as tested) The operating system that was installed on the computer at the time it was tested. The operating system is the software that controls the basic operation of the computer. Battery capacity (WHr) Battery capacity The total energy contained in the battery, expressed in Watt-hours. A larger capacity battery will deliver longer battery life, but will add weight and sometimes will extend beyond the edge of the Chromebook.